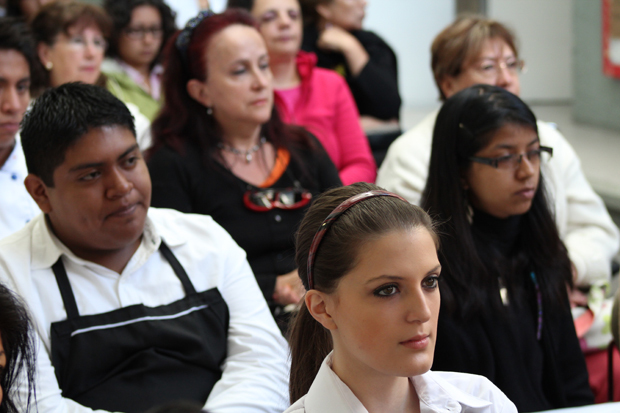 Students, parents and school personnel attending a Transparency and Accountability Session in Mexico City. Last December, 1,055 high school communities around Mexico – comprising almost 1.3 million students – engaged in a transparency and accountability exercise. This involves each principal of public high schools completing three electronic forms covering more than 100 indicators. These range from income and expenditure, to enrolment and academic performance, to the condition of school equipment and infrastructure. Then, during an approximately one-hour public session, principals present the main information to parents, students, teachers, staff and any interested citizens. At the end of the principal’s presentation, participants can ask questions, demand broader explanations and share suggestions or comments about the information presented. School principal César Mijares presents the report to the school community. “Seven years ago – when the Transparency and Accountability Sessions were first carried out – it was a complex task to gather all that information; it involved making access to information requests, visiting different websites or consulting several databases,” says Eduardo Bohórquez, executive director of Transparencia Mexicana, our chapter in the country. Now, it’s a lot easier for school community members to access this information, as the data and indicators are published outside each high school and can also be found online throughout the school year. More importantly, knowing this information can strengthen parents’ and students’ right to access quality education. By holding school authorities accountable and engaging with other members – such as teachers – needs can be prioritised and suggestions around school resources can be presented in a more efficient way. Certainly, the challenge is to transit from an informed community to one that actively participates in the school’s decision-making process. A mother expresses her concern to the school principal about the absence of a professor in a certain class.